Dr. Deborah E. Lipstadt decided to add one last paragraph to her latest book on anti-Semitism as she was about to send it to the publisher. “I’m a historian and generally don’t engage in predictions,” said the author of “AntiSemitism: Here and Now,” published by Penguin Random House in January. 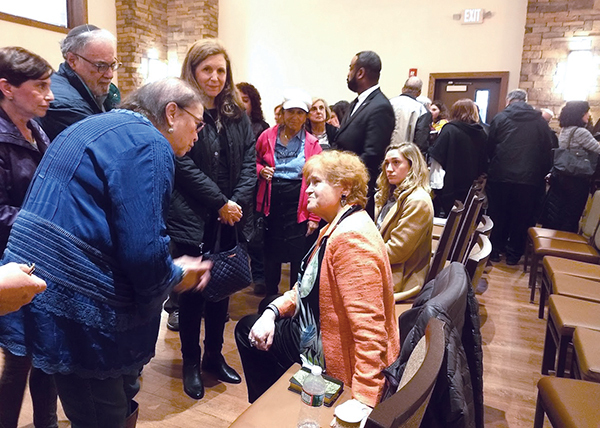 “Five weeks later, Pittsburgh happened and many other events since,” Lipstadt said about the Oct. 27 massacre of 11 congregants at the Tree of Life synagogue. Speaking March 31 before a sellout crowd of almost 600 people at Rutgers Hillel in New Brunswick, she gave an at-times chilling account of the rise of anti-Semitism in the United States and abroad, which can come from politicians, white supremacists, Muslim extremists, college students, one’s colleagues, and others. Lipstadt, the Dorot professor of Modern Jewish History and Holocaust Studies at Emory University in Atlanta who has devoted decades to studying the Holocaust and famously won a libel case against a Holocaust denier, said she is most disturbed by the effects of the rising tide of anti-Semitism on the Jewish community. She said she fears that four to five decades of being comfortable, openly observant, and accepted will be endangered if American Jews “go back in the closet,” especially on campus. Students won’t want to spend “four years fighting” anti-Semitism. Lipstadt said the classic tropes used to stir hate against Jews — they are “money-grabbers,” diabolically gain inordinate power, and are maliciously smart, have spurred anti-Semitism since the time Jews were accused of being responsible for the murder of Jesus. Throughout the ages, this portrayal of the Jew as the demon-in-disguise challenging God has been pinned on prominent Jews from the Rothschilds, the wealthy 18th-century German banking family, to George Soros, the liberal billionaire, noted Lipstadt. Today’s white supremacists perceive Jews as master manipulators. In their minds, no African-American is capable of being elected president or senator, unless someone is manipulating them. Anti-Semites on the left and the right have different frameworks for their hatred. The left portrays Jews as being the beneficiaries of white privilege, while the right doesn’t consider Jews white and believes they are, in fact, a threat to white people, particularly Christian males, said Lipstadt. In Charlottesville, Va., in 2017, neo-Nazis at a rally shouted, “Jews will not replace us,” meaning, said Lipstadt, there is a genocide taking place as Jews seek to destroy white culture. Others are anti-Semitic enablers who may not hate Jews but whose rhetoric acts as a “dog whistle” for those who do. These include, according to Lipstadt, Jeremy Corbyn of Britain’s left-leaning Labour Party and President Donald Trump, whose initial refusal to condemn white supremacist David Duke, and his statement about “very fine people on both sides” at the Charlottesville rally emboldened hate groups. “I hate to say it, but an enabler on the right is our own president,” she said. One manifestation of anti-Semitism is virulent anti-Israel sentiment, the kind which goes beyond criticizing Israeli policies. The real purpose of the BDS movement, she said, is “the toxification” of Israel. The Rutgers campus has not been immune to anti-Semitism. 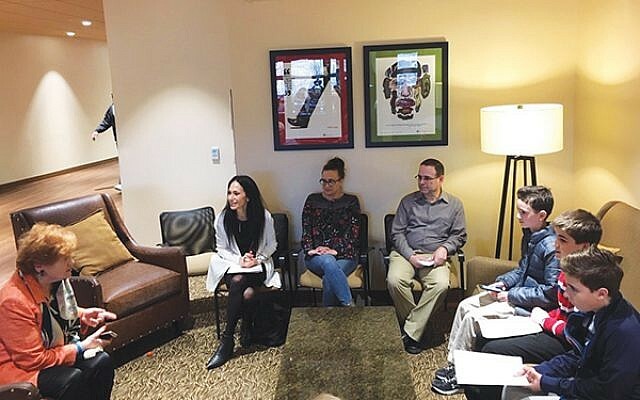 The university has been criticized in recent years for not sanctioning faculty members who express anti-Semitic viewpoints in published books or on social media posts. In addition, the Department of Education reopened in 2018 a civil rights case alleging that Rutgers permitted a hostile environment for Jewish students at a university program in 2011. 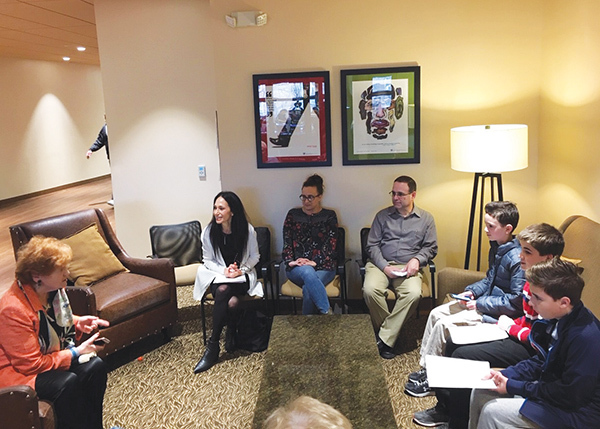 Prior to the start of Lipstadt’s talk, the Anti-Defamation League conducted a three-hour workshop on combatting discrimination for 60 students, faculty, administrators, and staff. 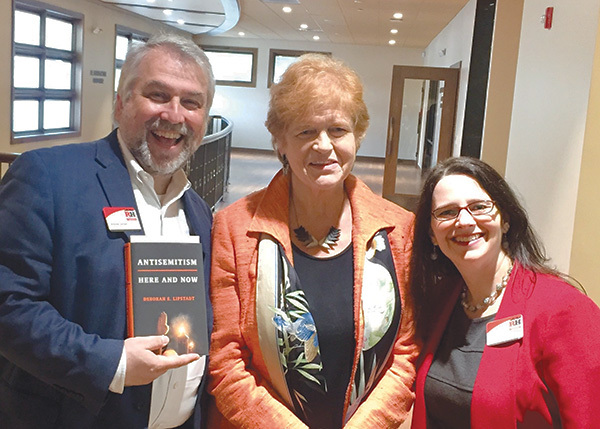 In addition to J-FAS, Lipstadt’s appearance was supported by Rutgers University’s President’s Initiative on Diversity and Inclusion, the Hann Foundation, Harriet and George Blank, Rutgers Hillel, and the Jewish Federation in the Heart of New Jersey.